It’s called a slump, and it’s common. From small businesses to multinational corporations, a drop in sales here and there is to be expected. 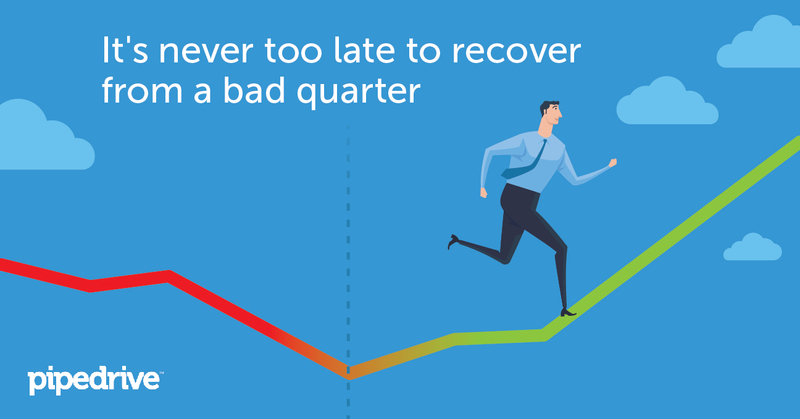 Here’s how you can overcome problems and save the year in quarter two. The first thing to do differently in the second quarter is figuring out why your sales team didn’t meet its goals in the first place. “Don’t freak out or get emotional, but be curious and analytical,” Abbott said. “The answer will either be external factors or internal factors, or both,” he said. While it’s more challenging to deal with changes outside of your control, “you need to know what’s going on, so you can formulate a strategy to respond,” he said. Understanding what goes on in your industry is key to unlocking the second quarter, but never neglect looking internally, too. That’s where you’ll often find most answers, but don’t beat yourself up. The good news is that you have much more control when it comes to internal factors, and you can turn things around. It turned out that the marketing department generated plenty of opportunities for the pipeline, but the sales team couldn’t convert the leads to appointment. “We ran a blitz day with the sales team to follow up on all the leads from marketing to find out why that happened. We wanted to see if the marketing leads were bad, or if it had something to do with the sales team,” Lee said. Take time to analyze your team’s sales calls to see what gets missed. “This is what a manager needs to check with salespeople all the time: What do you do? What do they say? What do you say?” Abbott said. Abbott said a salesperson’s attitude has a lot to do with the success of a sale. “If you are not pumped up about what you do and don’t believe in the product, how will your customers get excited?” he said. Now that you know what went wrong, it’s time to make some changes. In addition, make sure your salespeople know the value they bring to customers, and the success your company generates in their lives or businesses. “We trained a group in a tough industry. They face a lot of rejections and started doubting their product and themselves,” he said. Abbott’s training helped the salespeople “reignite the passion in what they have and do, and how they help people. Once you believe that, you’re not selling, you’re storytelling about how you help people — and that makes a huge difference,” he said. How huge? Abbott’s client increased sales by a 100%. Getting salespeople excited was an integral part of the team’s newfound success, but another important part was giving them tools to improve their sales process, like “different ways to ask for the sale that they could add to their repertoire,” Abbott said. He recommended taking a close look at the skills your team needs. “Are you prospecting effectively? Are you qualifying leads effectively? How are you getting to decision makers? How is your product knowledge? Do you ask questions to understand prospect needs or are you just pitching? Are you asking for the sale? Get back to basics,” he said. Lee trained her client’s team about sales basics, too. “We trained them in what their value proposition should be for a gatekeeper, what their value proposition should be for a decision maker, and how to handle objections,” she said. The training made a huge difference. “After giving them the training, they were able to have more effective conversations with people. They were able to get appointments and get more opportunities in the pipeline, and they were able to make their quotas,” she said. Use the second quarter to develop systems that generate leads more consistently and qualify leads better so you can eventually predict your revenue. According to Abbott, some bad quarters take place because businesses fall into the feast-or-famine cycle. He recommended that, no matter the results of your last quarter, always stay strategic about getting that next sale. Lee agreed, adding that by always having enough qualified leads in the pipeline, your salespeople won’t have the pressure to close every opportunity. “Salespeople should have at least three times the revenue they need in the pipeline at all times,” Lee said, explaining that if they need to close $100,000 a month, they should have $300,000 in their pipeline all the time. Come up with a realistic schedule that enables you to generate leads and grow new sales, but don’t forget about current customers. “You need to keep current customers happy and deliver great customer service,” Abbott said. Increasing retention rates will make it easier to meet your sales goals. This time, don’t wait until the quarter ends to analyze what’s going on. Clarify sales goals with your team, and set a solid foundation for the rest of the year by making sure your salespeople have the tools they need to make it a success. To get out of this slump, review progression on a weekly and monthly basis, so you can make adjustments faster, but encourage your team to keep taking steps forward even if they don’t see results right away. Remember that change takes time and you might only see the fruits of your labor later in the year.